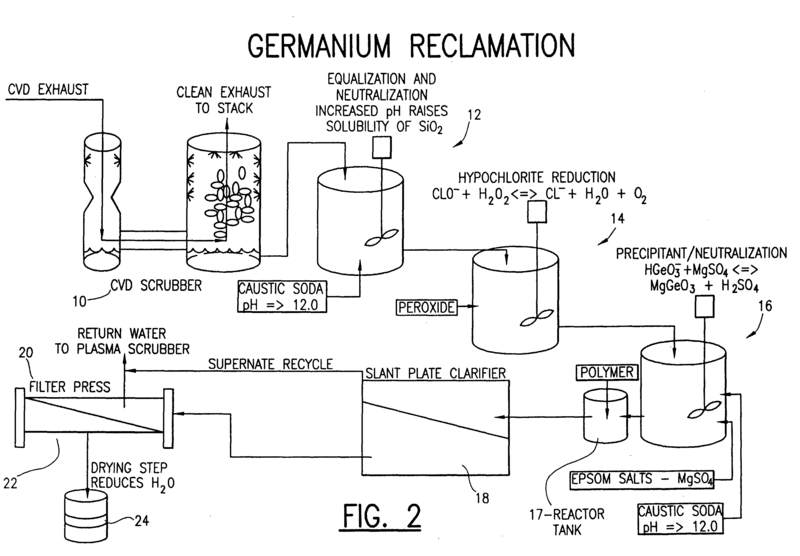 A continuous system recovers germanium (Ge) from a chemical vapor deposit. A chemical vapor deposit scrubber scrubs a chemical vapor deposit to form a chemical vapor deposit scrubber solution. An equalization and neutralization mixer adds a caustic soda to the chemical vapor deposit scrubber solution to form an equalization and neutralization mixer solution having a pH above 12.0 to maintain the solubility of silicon oxide (SiO.sub.2) and hypochlorite (ClO.sup.-). A hypochlorite reduction mixer adds a peroxide to the equalization and neutralization solution to form a hypochlorite reduction solution to reduce hypochlorites. A precipitant and neutralization mixer adds a metal cation such as Epsom Salts (MgSO.sub.4) and a caustic soda, such as sodium hydroxide (NAOH), to the hypochlorite reduction solution to form a precipitant and neutralization solution to precipitate magnesium germanate (MgGeO.sub.3) and magnesium metasilicate (MgSiO.sub.3). A reactor tank adds a polymer to the precipitant and neutralization solution to flocculate the germanium (Ge) and silicon (Si) solids and form a flocculation solution. A plate clarifier collects the flocculation solution to form a flocculated material. A filter press and the dryer produces a dry sludge of germanium (Ge) within a range of 5%-10% by weight. The present invention provides a continuous system for recovering germanium (Ge) from a chemical vapor deposit, having a chemical vapor deposit scrubber, an equalization and neutralization mixer, a hypochlorite reduction mixer, a precipitant and neutralization mixer, a reactor tank, a clarifier and a filter press and a dryer.